Geologic Information: Why take your kids to an ordinary playground slide at the park, when you can go to the slide named after the Devil himself? 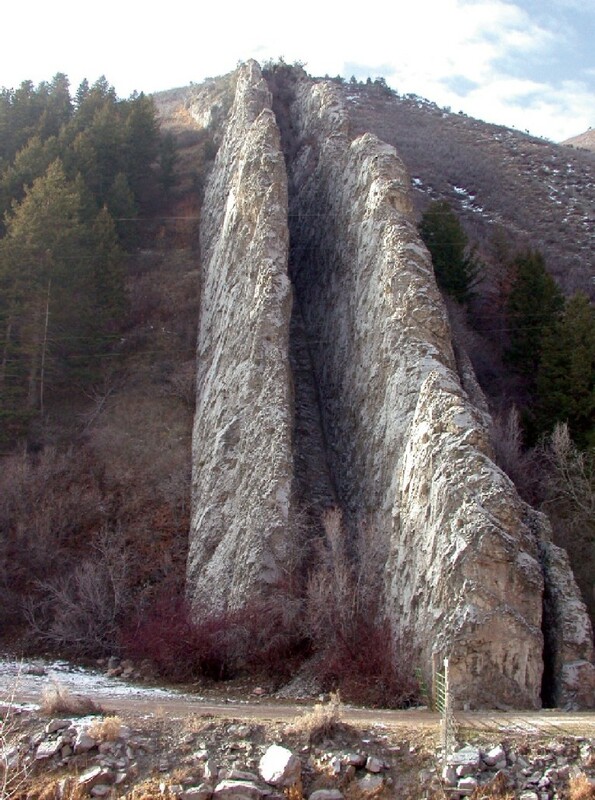 Unfortunately for sliders, Devils Slide is not a real slide, but an unusual geologic feature found in northern Utah. Devils Slide looking from the south. Gate in the foreground for scale. Devils Slide is a classic example of how different rock layers, depending on their composition, are affected by weathering and erosion. 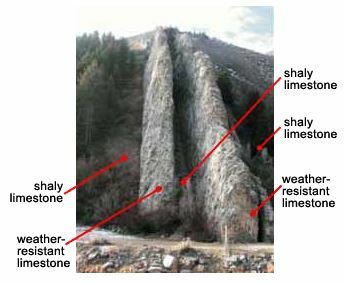 The sides of the slide are hard, weather-resistant limestone layers about 40 feet high, 25 feet apart, and several hundred feet in length. In between these two hard layers is a shaly limestone that is slightly different in composition from the outer limestone layers. This middle layer is softer, which makes it more susceptible to weathering and erosion, thus forming the chute of the slide. Looking like a large playground slide fit only for the Devil, this site is a tilted remnant of sediments deposited in a sea that occupied Utah’s distant geologic past. Approximately 170 to 180 million years ago, a shallow sea originating from the north spread south and east over areas of what are now Montana, Wyoming, and Utah. This sea extended as far east as the present-day Colorado River and south into northern Arizona. Over millions of years, massive amounts of sediment accumulated and eventually formed layers of limestone and sandstone. In northern Utah, these rocks are known as the Twin Creek Formation and are approximately 2700 feet thick. About 75 million years ago, folding and faulting during a mountain- building episode tilted the Twin Creek rock layers to a near-vertical position. Subsequent erosion has exposed the near-vertical rock layers and created Devils Slide. How to get to Devils Slide: 1. From the I-15/U.S. Highway 89 interchange in Farmington; head north on U.S. Highway 89 for 10.7 miles to a sign indicating the route to Morgan and Evanston. Turn right (east) on I-84 and travel approximately 23 miles to the scenic viewpoint turnoff located after milepost 110.
or 2. From the southern I-15/I-80 interchange in Salt Lake City; head 11.3 miles east on I-80 to exit 134 (Mountain Dell Recreation exit). Travel north on Utah State Highway 65 for 27.7 miles to the town of Henefer. Turn left (west) and proceed 1 mile to I-84. Turn left (west) onto I-84 and travel 2 miles to the scenic viewpoint turnoff located just after milepost 111.